Last night(December 6th) the Refinery29 29Rooms Los Angeles: Turn It Into Art Opening Night Party took place at ROW DTLA in LA. To see all of the celeb looks, click HERE and continue below for the wrap-up. Gabrielle Union wore grey wide-leg, plaid trousers which she styled with a TOME FALL 2017 black zipper detail, crop jacket and a white button down shirt. The pants are of course too long but this is a cute look. Curly locks and a white bag finished up her look. Victoria Justice wore a ALICE + OLIVIA RESORT 2018 black & red heart printed, ruffle tier halter dress which she toughen up with black suede ankle boots. Center part waves and a colored lip finished up her great look. 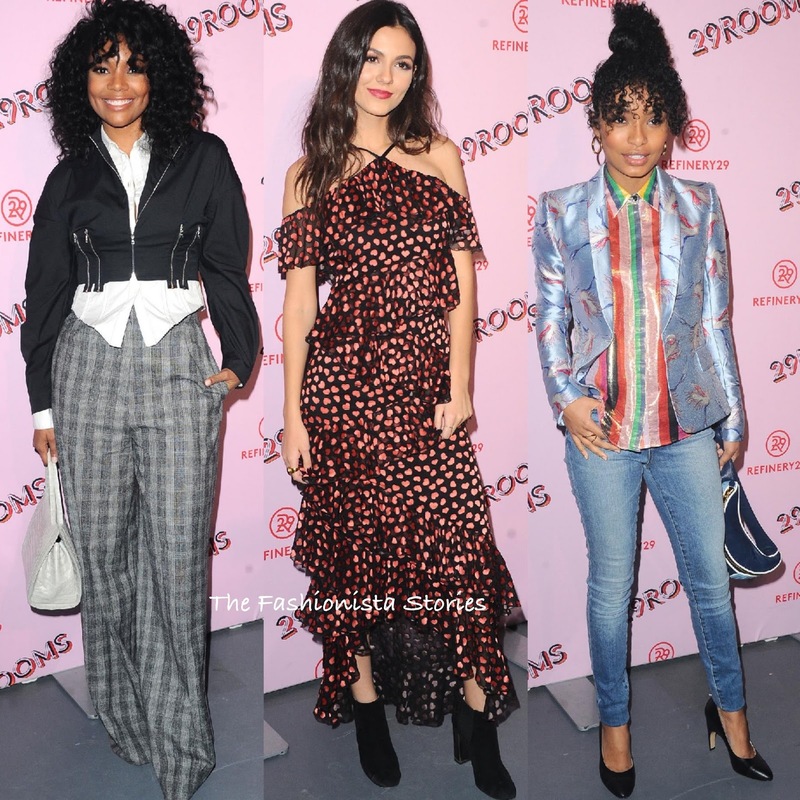 Yara Shahidi also wore ALICE + OLIVIA. Her SPRING 2018 light blue bird printed blazer & stripe shirt was teamed with J BRAND jeans. A curly up-do, a fanny pack and black pumps finished up her look. The blazer looks a little snug and their is a lot going on color wise but this is a fun look that comes together. Kat Graham wore a MONSE SPRING 2017 white long sleeve shirt dress with a pleated hem and a black MUGLER skirt. The skirt over long shirt seems to be the next trend and I think it's cute when it works. Black accessories and side parted curls finished up her look. Angela Sarafyan wore an ADEAM RESORT 2018 white ensemble which featured a long sleeve pleated, draped top and wide-leg trousers. The top is not the best look on her but I still kinda like this. Side parted waves and a box clutch finished up her look. Gillian Jacobs wore a MSGM PRE-FALL 2017 camel heart detail sweater which she styled with a white mini skirt. The sweater was shown as a v-neckline and in a different color in the look book but I like this version on Gillian. Side parted waves, a yellow small bag and the SAM EDELMAN 'Oran' black suede mules finished up her look.